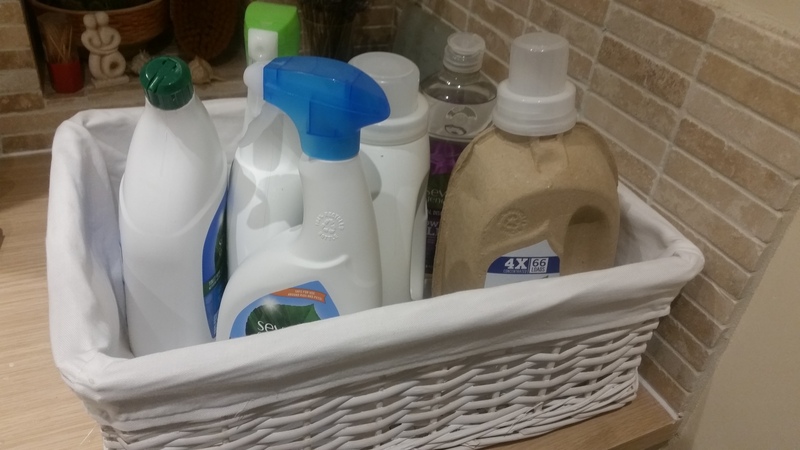 This blog post has been sponsored by Seventh Generation who make eco-minded cleaning products. Opinions are all my own! When I started this blog over 6 years ago, one of the first things I looked at was cleaning products. I used to buy normal cleaning products and an eco-friendly washing up liquid. The normal products came with scary symbols on the back of them with things like toxic and dangerous to aquatic life. I decided it was time to stop using these toxic cleaning products. So I replaced my old cleaning products with vinegar, bicarbonate of soda, lemon juice, washing balls and cleaning cloths and water. I got so excited about it I even wrote this poem – R.I.P. My chemical crammed cleaning cupboard Most of my replacement cleaning products work really well. I couldn’t quite crack the toilet cleaning though and eventually went back to putting bleach down the toilet. We use washing up liquid at times too, because my husband refused to be without it. I ended up going back to mainstream products for dish washing and toilet cleaning that weren’t eco-friendly. When Seventh Generation offered to send me some of their cleaning products to try out I decided to give them a go. If I am going to have some mainstream cleaning products in my home I would rather have environmentally friendly ones. I received a bottle of cleaning spray, two bottles of laundry detergent (one concentrated and one not), some washing up liquid, some glass spray and some toilet cleaner. The products I received either have a mild fragrance or are fragrance free. I really like the fragrance of the mint and lavender scented dishwashing liquid – two of my favourite herbs! Most of the products come in plastic bottles which are 100% recycled. One of the laundry detergents has a plastic inner and cardboard type outer made of repurposed fibre. It says on that bottle that ‘this package uses 66% less plastic (than a typical 2.9l laundry bottle)’. I am not a fan of plastic. One of the reasons I moved away from mainstream cleaning products was to avoid it where possible. Recycled plastics are one of the better plastic choices out there though and are currently preferable to biodegradable plastics. This is because biodegradable plastics often either end up in recycling or landfill, neither of which are beneficial. In landfill they don’t biodegrade because the conditions aren’t right. If they are put into the recycling they can contaminate the batch as they are not suitable for recycling. They also can’t be put into a compost heap as they won’t break down in a home compost bin. Seventh Generation uses sustainability sourced palm oil. While there are sustainability and social issues associated with the rapid expansion of palm oil plantations into high conservation value rain forests in South East Asia, Seventh Generation pays a premium to support the production of Roundtable on Sustainable Palm Oil (RSPO) Certified Sustainable Palm Oil, which ensures that palm oil is not produced on forestland cleared since 2005. Seventh Generation are avoiding paying for palm oil from newly cleared forests, however they are still adding to the demand for palm oil. I mentioned earlier that we have been using a mainstream washing up liquid, which also contains palm oil, which is not sustainably sourced. It also does not come in a recycled plastic bottle, so compared to that I would prefer to use the Seventh Generation washing up liquid. It isn’t an ideal solution though. I usually use balls to wash my clothes. I didn’t notice any benefit of using the detergent over the balls. The balls work out a lot cheaper and create less waste overall compared to buying bottles of laundry detergent. The laundry detergent came in two different types of bottles as I mentioned earlier. One was a brown cardboard type material with a plastic bag inner and the other was a recycled plastic bottle. The cardboard one says it used a lot less plastic than the plastic one. That’s good, but I found the liquid dripped onto the cardboard and I couldn’t clean it off as easily. The worry is that the bottle won’t last long if it gets damp or wet or squashed for any reason. It was also hard to work out if I was pouring in the right amount of detergent because I found the level indicators really difficult to see. I was sent two spray products. A surface cleaner and a glass cleaner. The surface cleaner had a bit of a losing battle because I don’t see the point of them. I usually clean surfaces with water and a cloth. I add a bit of vinegar or bicarbonate of soda for antibacterial action if needed. The surface cleaner was not antibacterial and so I just didn’t feel like I needed it. I put it to the test though and cleaned out some cupboards. I wiped them with water, then I wiped them with the spray and couldn’t see the difference. The cupboards had loads of marks on them though which only disappeared when I wiped them with bicarbonate of soda. I also struggled to see the markings on the spray nozzle for spray and stop. The window cleaning spray didn’t compare to the action of a microfibre cloth and water. (Although microfibre cloths are also problematic because when washed tiny plastic fibres leach into the water they are washed in). Again the markings on the nozzle were difficult to see. The final product I tried out was the toilet cleaner. I found the lid a bit confusing to start off with and took it off, instead of popping up the sticky out bit in the lid. When I took the lid off I dropped it down the toilet – doh! I was quite happy with it though once I had cleaned it up and worked it out, . My toilet wasn’t particularly dirty, but it seemed to work ok. I would probably prefer to use it as it is in a recycled bottle and the ingredients seemed better than using bleach. There is no SLS in the toilet cleaner and the list of ingredients seemed less complicated than some of the other products. I wouldn’t buy all the products, but I would consider buying the washing up liquid and toilet cleaner. Thanks to Seventh Generation for giving me their products to try out / sponsoring this post and for taking the environment into consideration when developing their products.